Please wait, we are validating your request. The Norwegian Level B1-3 course continues where Level B1-2 finished. 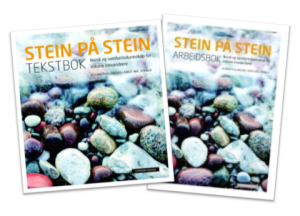 Level B1-3 covers the final chapters 11 to 14 in the curriculum book “Stein på stein” (2014 edition). It is the third and final intermediate level. Level B1-3 focuses on developing your grammar skills to a practical level, increasing vocabulary further, and will among other things make it easier for you to have conversations with more complex sentence structures and write simple texts. Weekday courses last for ten sessions during five weeks. Weekend courses last for six sessions during six weeks. The sessions are held on two weekday mornings, evenings or Saturdays every week. Each course last for 36 lesson hours. * Bygdøy allé 68 (Morning courses). * Pilestredet 75C (Evening and Weekend courses). We do not have B1-3 courses at the moment. 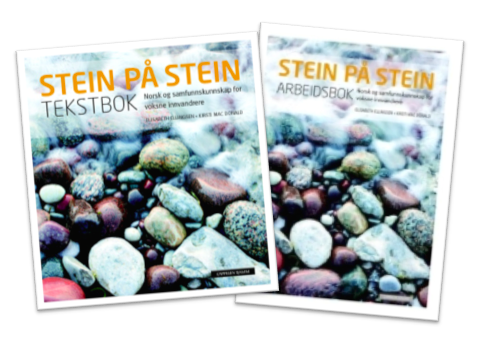 You need to buy the books “Stein på stein: tekstbok” and “Stein på stein: arbeidsbok” (2014 editions). You will find both books in Norwegian bookstores, online bookstores and libraries (the libraries often have waiting lists for the "Stein på stein" books, so we advise you to apply there early). The "Stein på stein" curriculum book is based on the official Læreplan i norsk og samfunnskunnskap for voksne innvandrere ("Teaching Plan in Norwegian and Societal Knowledge for Adult Immigrants"). This ensures that what you learn adheres to official requirements. It also means that you will be learning useful and interesting things about Norway while you learn Norwegian. Are you affiliated with AIESEC? In that case you may be eligible for a discount on our Norwegian courses in Oslo! Contact us for details. * Bygdøy allé 68 (Daytime). Copyright © 2019 Norwegian courses in Oslo. I have read the terms and conditions including those regarding registration, payment and cancellations. 2) Select to pay by invoice, not card. Don’t worry, we will send you a link to pay the discounted price by card if you ask for card payment in the comment box in the signup form. 3) Write “Black Friday” in the comment box in the signup form. The offer lasts until midnight on Monday (the 26th).